Boundless first burst onto the gaming scene as Oort Online back in 2014. It has been a Steam Greenlight project since then, including an early name change in October 2015 as well. Now, almost three years later, Boundless has launched not only on PC, but also as a console exclusive on the PlayStation 4. Can developer Wonderstruck’s crafting survival game differentiate itself enough from all the others, since it features an always online, cross-platform universe of procedurally generated worlds? Read our verdict in our Boundless review below. Boundless may appear at first glance to be a Minecraft clone. It has a similar core gameplay loop, to be sure. Players must collect nearby resources to craft things such as crafting tables, furnaces, workbenches, and more, in order to craft better items, to then collect better resources with. But Boundless differentiates itself in several ways. First off, Boundless features a procedurally-generated universe, full of pseudo-randomly generated worlds. Much like No Man’s Sky, planets are created with different types of weather, resources, fauna, and overall difficulty. Procedural generation means that sometimes you’ll end up with a planet described as an “inhospitable lush world,” which of course makes no sense but is fun all the same to attempt to survive in. As with many games in this genre, the start of Boundless is likely the slowest part of playing it. There is a tutorial, but it doesn’t do a great job of explaining how to find or craft things mentioned in objectives. After a good couple of hours, though, most players will have figured out a good chunk of Boundless’ systems. Some players may even become rich, at least in-game. Each planet has a capital city, which contains the largest concentration of players for that world. These are interconnected hubs, full of portals to other worlds. Crafting and using specialized amulets enables players to simply look up into the sky, which always contains nearby, procedurally-generated planets, aim, and fire onto any spot on that planet. This will then enable the player to create a portal, linking the world they are currently on with the target. Transitioning between worlds is an impressive game mechanic, as other than a brief moment where the portal is blank, walking through a portal allows for instantaneous travel to another world, with its own sets of biomes, flora, fauna, and overall difficulty. Think of the ease with which moving between locations in the Portal series of games was, and that’s the travel speed of the portals in Boundless. Since each planet has variation in which of Boundless’ many resources are rare and common, economies and trade routes have become core to the way many players experience the game. Shop stands can be set up, and are indeed a main draw of capital cities. Players set their own prices on items or resources that they buy and sell to each other. The idea is that players can eventually even charge to simply travel along a route, if the player who created the route decides to charge for the privilege. With such a focus on player interaction, Boundless may sound ripe for the trolling. What’s to stop people from destroying another’s hard work? Cubits and plots are the answer. As players level up, they are awarded loot boxes of various quality. Every level is guaranteed to net players a certain amount of cubits, which is Boundless’ in-game premium currency. Leveling up produces enough cubits to purchase two plots. Each plot is a cube, 8 squares on each side, which becomes reserved for the plot owner. Everything contained within this cube cannot be modified by players other than the owner, and those whom the player has granted explicit permissions to. Even interacting with items within a plot can be managed. While plots can be purchased outright for the player who just cannot be bothered with a grind or absolutely feels like they need to buy up a bunch of premium real estate, for the most part simply playing the game and completing objectives will reward enough plots to get by. Some games with persistent worlds such as ARK: Survival Evolved require constant upkeep of player-created objects, or else they disappear in a short amount of time. Not so with Boundless. For instance, the default expiration of a player-generated beacon, which protects all items inside a plot, is just over eight weeks. That’s more than two months that a player can neglect their claims before they need to worry about something being deleted or claimed. Beacons require fuel, and if they run out, their protection vanishes. At this point, other players can come by and add fuel to an empty beacon, claiming it for themselves and acquiring all items in the vicinity in the process. Boundless also features world wipes, though we have yet to witness one during our time spent with the game. Presumably, this will wipe any player-created objects outside a protected beacon or campfire, in order to reset things and make some resources available for others again. It’s an interesting system, and this longer lasting version of a persistent world reflects the reality of most of our lives. 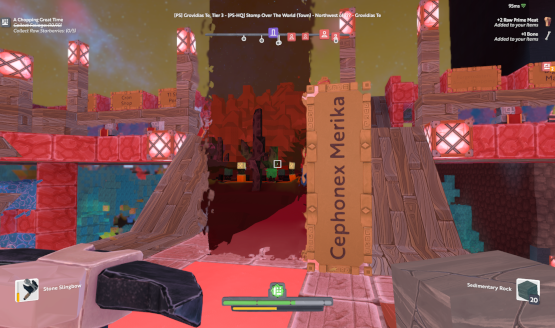 We get sick, take vacations, or otherwise disconnect from our consoles from time to time, and taking a week or two off from Boundless shouldn’t result in your massive castle, painstakingly built brick by brick, from being deleted or going to someone else. Boundless has a heavier emphasis on RPG elements than most games in this genre. Two skill points are awarded each time a player levels up, which can be spent on upgrading core attributes, such as health or luck, agility, etc. But once certain milestone levels are achieved, “Epic” attributes can be unlocked, though these cost more than a typical skill. This can include such a abilities as automatically healing, or simply a large increase in health points. Death isn’t nearly as harsh in Boundless as in other crafting survival games—your character keeps all their equipment and inventory, but suffers a 50% reduction in XP received for a certain amount of XP. 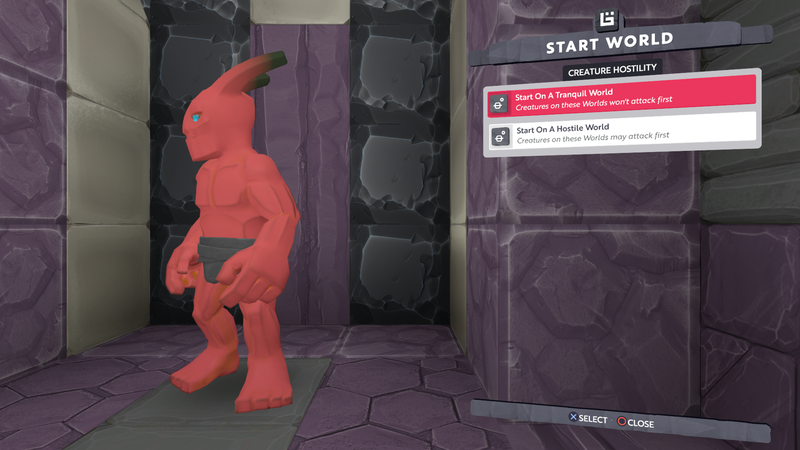 In this way, Boundless encourages risky exploration, such as mining near lava or attempting to survive in a treacherous world for the sake of collecting precious rare materials. While Boundless may not have the most approachable initial tutorial, it does have a robust system it calls a journal. Various missions are generated here, which serve mostly as a way to learn the game. This provides a constant stream of ways to play the game, in different tiers such as exploration, crafting, and trading. These missions reward a decent chunk of coins and XP to boot. In a seemingly rare occurrence in Sony’s world, Boundless supports cross-platform play between PS4 and PC players. The integration is seamless, as you cannot tell who is playing on what, though perhaps the speed of messages coming from a player may be one way to know. The benefits for this cross-pollination of player bases are obvious. Since Boundless has been around in one form or another on PC since 2014, it has had ample time to build up a healthy population of citizens (as players are known in the universe of Boundless), and so the version that has launched on the PS4 is the best version of the game to date. A custom game engine runs Boundless, and it runs incredibly well on the PS4 Pro, despite all that is happening in the background. The procedurally-generated landscapes are varied, featuring a multitude of differently-colored grass, soil, gravel, rocks, lava, and more. Biomes have great atmosphere, as well. Find yourself in a forest? Expect to hear birds chirping or hooting. Caves feature echoes of actions performed, which is a great detail to include. A dynamic soundtrack ramps up as players encounter enemies, settlements, and one another, as well. Boundless has a lot going for it. Seamless cross-platform multiplayer ensures there’s almost always other players to interact with. Yet planets are also large enough to eke out a solitary existence if one so chooses. Much like Minecraft, there is a large time commitment required to have any real sense of progression, or to make a lasting mark on the world. In this case, however, any marks players do leave behind will stick around for others to see for quite a while. A constant drip-feed of mini-quests helps to move players along in their progression, as well. Whether with friends, strangers, or by yourself, Boundless ensures there’s always something new to do in a connected universe, one which rewards those who put in the time. Boundless review code provided by publisher. Version 1.03 reviewed on a PS4 Pro. For more information on scoring please see our Review Policy here.